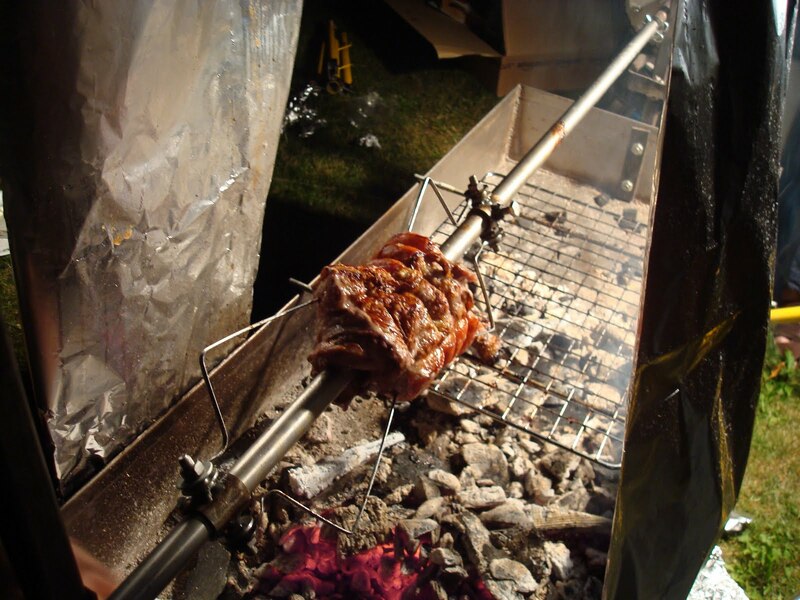 In Greece, spit-roasting a whole lamb is an Easter tradition. Driving through town on a warm Easter Sunday, you can smell lamb being cooked in every house’s back garden. Of course, if you haven’t got a garden or the patience or in the unlikely event that the weather is bad you can always roast it instead. But it’s just not the same. My boyfriend, because he is amazing, decided to make a spit. And being amazing, he managed to make it over a couple of days in the summer using bike gears, a car’s windscreen wiper motor and a computer’s power supply. It looks the part and it works like a dream! In a few weeks we are going to have The Best Meat-Eating Party/BBQ featuring a whole spit-roast lamb but for now, just to warm up, we thought we’d do some chicken. Alex covered it in olive oil, salt, pepper and herbs and it got tied on the spit. 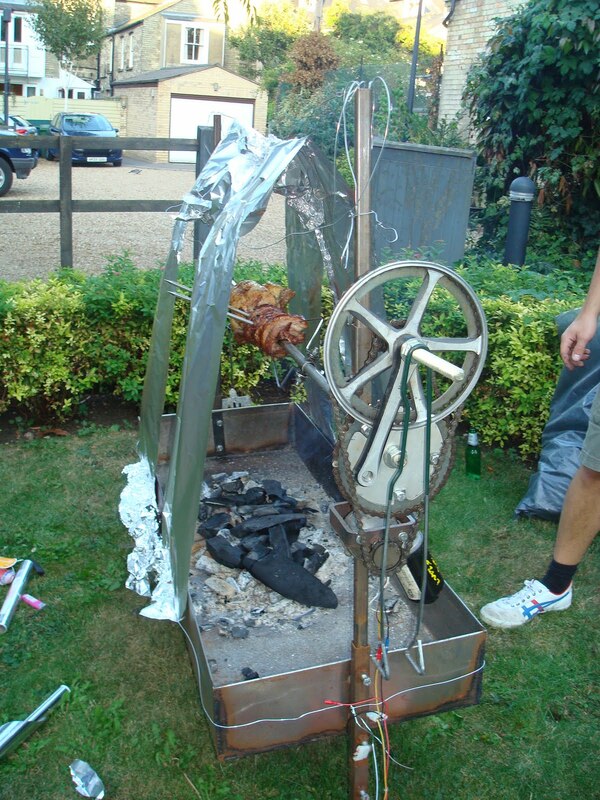 We had also bought a couple of pork belly joints and one of them went on the spit at the same time. They were looking cooked surprisingly early, about an hour later. 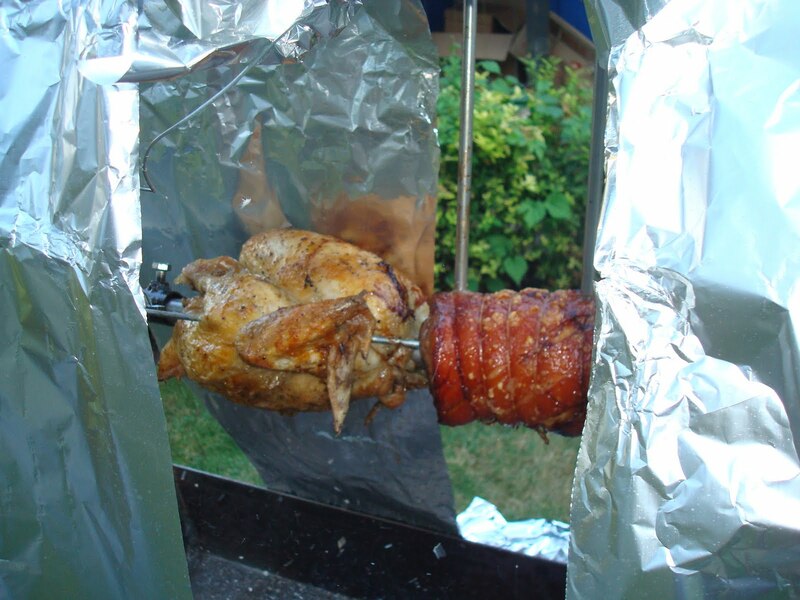 The skin was crisping up nicely and the pork crackling looked great. When we cut the meat off, it was very juicy. I am not a fan of chicken breast, I find it boring and dry, but this was really good. I had it in a bap with some home-made Spicy Feta and Roast Red Pepper dip which is pretty easy to make and always goes down well at bbqs. Just roast the peppers until the skins are black in places, let them steam in a bowl with a lid on the top and then peel them. Pop some chillies, the peppers, the feta and some olive oil in the food processor and you’re almost done! I usually add freshly ground pepper, paprika and some dried oregano. It goes well with most meats really or as a starter with some pita bread. It was a beautiful night, probably the last one of the summer and the fire kept us warm as it got darker. I will post again with news from the lamb spit-roast mission, for now we’re trying to make sure we get the lamb with the head on, as well as some intestines and the liver to make Kokoretsi.